The Tejo region of Portugal has produced wine since Roman times. 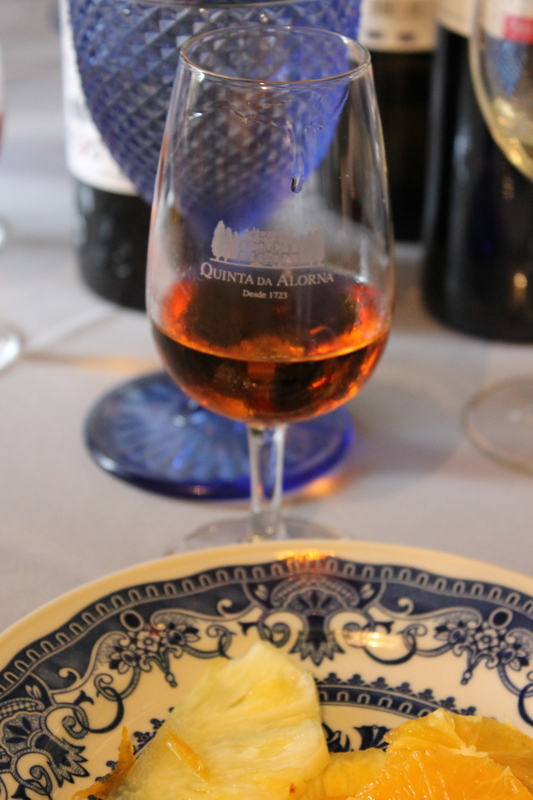 However, most wine drinkers will not recall drinking any Tejo wine. This is not a surprise as this wine has historically been blended with wines from elsewhere in Portugal or just sold as generic “wine of Portugal”. Tejo has upped its game in recent years. The grape growers and wine makers of the region have made a huge investment in quality and now make wine the equal of many better-known areas of the world. 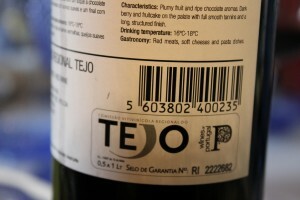 In order to be designated DOC Tejo, a wine must be made of grapes grown exclusively in the Tejo region. The yields must be controlled: below 8,000 liters/hectare for whites and 9,000 liters/hectare for reds. The wine must be made only from certain grapes and it must be judged by a panel from the Tejo Wine Commission (Comissão Vitivinicola Regional do Tejo) for quality and typicity. However, there is one recent development that I feel is negative: 2010 DOC rules now permit international varietals in DOC wines — up to 100% percent of the volume. From my point of view, this dilutes the distinctiveness of what it means to be a Tejo wine and, notwithstanding the short-term marketing fillip, may damage the long-term prospects of the region, depending on how the producers decided to use this allowance. 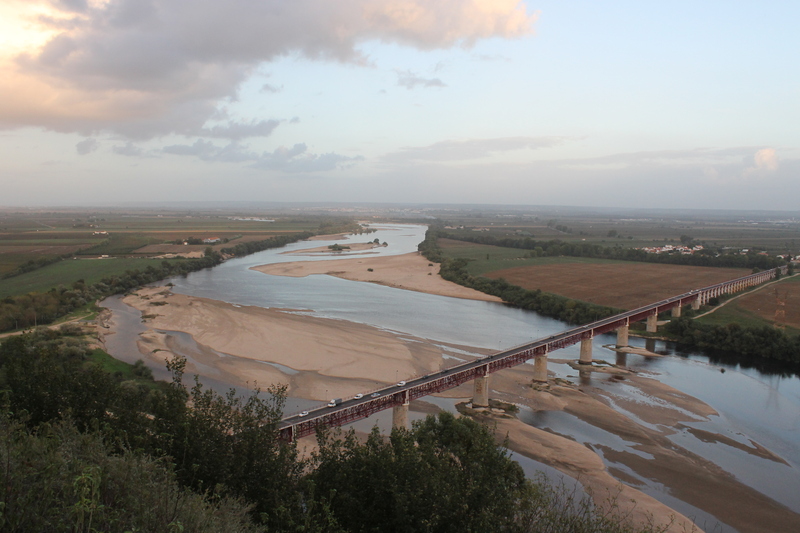 The Tejo region straddles the river of the same name (Tagus in English) about thirty miles north of the Portuguese capital of Lisbon. The 19,000 hectares of vines are divided into three subregions by their terroir. The Campo refers to a sleeve of fertile soil that hugs the river on either bank. Its clay alluvial soils are subject to frequent flooding and see a variety of agricultural uses in addition to vines. Mainly white wine grapes are planted here. 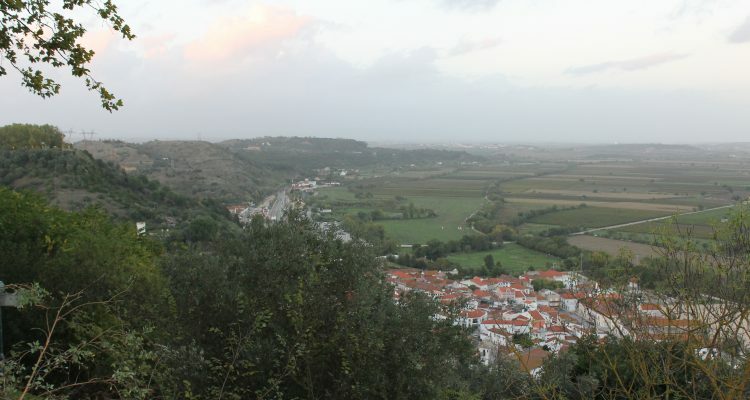 Bairro soils, with clay and limestone, lie along the west bank of the river outside the Campo and range from flat to rolling hills, on into the Candeeiros and Montejunto mountains. Charneca is in the area on the eastern bank of the river. It is monotonously flat and these sandy soils are less productive in a volume sense but more typical of vineyard land elsewhere. Some of the soil contains schist, promoting deep roots for the vines. These varied terroirs have proven conducive to growing a large number of grape varieties. Among whites, fernão pires arinto and verdelho are the most popularly-grown. The tongue twisting (and most widely grown) fernão pires makes vibrantly fruity wines of medium high acidity with flavors of lemon and lime. It is usually vinified without oak and could substitute for Pinot Grigio in many contexts. Arinto is less fruity and more acidic. It is in fact used as an acidifier in wines that would otherwise be considered flabby. Verdelho is found only in small quantities and can be sold either as a monovarietal wine or used for blending. In addition to the native varieties, a couple international white wine grapes are grown throughout the region. Sauvignon Blanc is rarely made as a monovarietal but is common in blends. Chardonnay usually appears on its own, vinified in a style reminiscent of Chablis. The native reds include touriga nacional, trincadeira, castelão and aragonez (sometimes referred to as tinta roriz), which is better known as tempranillo in Spain. The region’s annual 2800 hours of sunlight produce ripe fruit in all of these varieties but touriga nacional has the most distinctive flavor profile here; it may even make better table wines in The Tejo than in The Douro. International red varieties include the ubiquitous cabernet sauvignon, which is usually blended into native varieties to contribute structure; the result is an unequivocal New World style wine. Alicante bouschet is used to add color. Syrah, is both blended and bottled as a monovarietal. And merlot which, in the examples I tasted, never seemed to smell or taste like any Merlot that I have had whether blended or bottled as a monovarietal; it lacked the typical mocha and red fruit, and seemed embellished with mint and black cherry olfactory notes. The strongest suite in Tejo is red wine — reds that are either touriga nacional (or blends of at least 50% thereof), trincadeira (and blends built around it), or equal-weighted blends of both of these native red grapes. Any of these three models can produce wines that are pleasant, distinctive and copacetic with a wide range of food. There are two styles: opulently fruity wines with velvety tannins that make them ideal for immediate consumption; and new French oak-aged examples that have more structure and age worthiness (the winemakers claim over ten years of improvement). Among the latter, I was seriously impressed by a 1995 Casa Cadaval Trincadeira served at the winery. The bright red fruit was still intact and the tannins soft and resolved. Despite the varietal difference, the flavor profile was not unlike an old Bordeaux. I did think that if we had caught this wine two or three years earlier it would have been even more impressive, but the 10+ year test was decisively passed. In the same tasting, a 1994 Cabernet Sauvignon was at its peak. The presence of such a seriously vinted international variety in the product range of one of the region’s foremost wineries indicates how entrenched these varieties are. A very fine producer of touriga that exemplifies what might be called a modern style is Casal Monteiro. Situated in the Charneca zone, this winery produced the standard white wine of the region in the 1980s. It fell behind the times and went bankrupt in the global financial crisis of 2008 (from which Portugal has not yet recovered). The non-producing winery was purchased, in a state of disrepair, by physics professor Miguel de Jesus and his father (a farmer in the area). Their wines, from the 2009 vintage onwards, show high quality, especially the Forma de Arte, a touriga nacional/cabernet sauvignon blend. 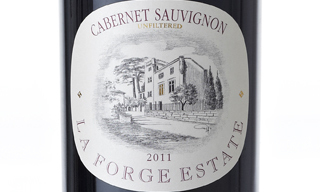 The nose shows effusive, potent fruit of blueberries and stewed raspberries and hints of wood. In the mouth, this is a tellingly fruit-driven wine that can be comfortingly quaffed or paired with red meat. Its fleshy tannins suggest several years of ageing potential. 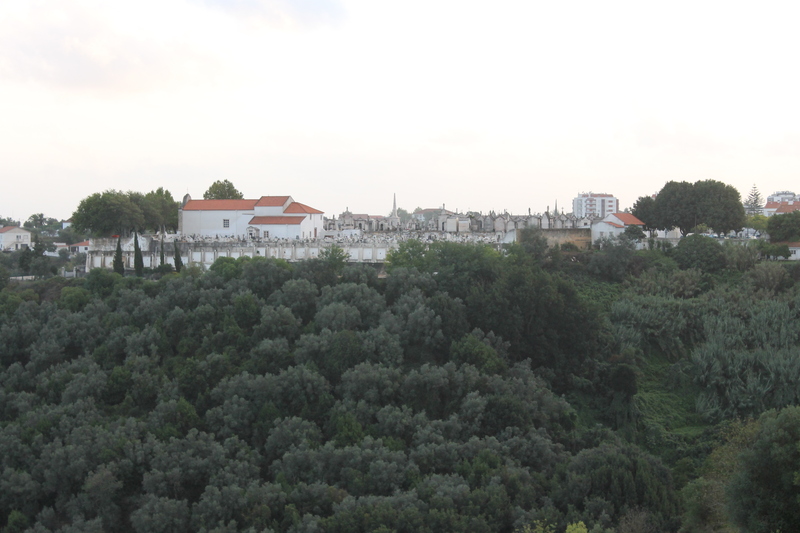 Over the fence, so to speak, from Casal Monteiro is Quinta da Alorna. Their flagship wine is the Marquesa de Alorna Tinto, an undisclosed blend in a more mainstream style. It is a tightly structured, complex ball of fruit that demands ageing. Keep this serious wine for at least a decade and then sample appropriately until mature. Another successful producer of indigenous red wines is Agro-Batoreu. Look for their Terre Silvestre Reserve blended from touriga franca (50%), syrah (25%), alicante bouschet (15%) and cabernet sauvignon (10%). The touriga franca dominates in this powerful wine. Although the whites of the region do not usually reach the refined heights of the Tejo reds, they are still 42% percent of the output. The fernão pires and arinto standbys are popular everyday wines sold at aggressive prices. Even with the whites, aspiration sometimes shines. The reliable Casal Branco fermented half its 2012 Falcoaria Fernão Pires in new French oak barrels and aged the wine on the lees in the same barrels, using periodic stirring to mix the flavors of the juice with that of the yeast. The oak-aged half undergoes full malolactic fermentation so that when the two halves are recombined the blend has a creaminess and an oakiness not unlike a New World Chardonnay. Even more heretical is David Ferreira’s work at Casa Cadaval with viognier. He barrel ferments all of the viognier used in his 2011 Padre Pedro Reserva and ages sur lees in new French oak barrels. Arinto is used to telling effect as an acidifier at 10% of the final blend in order to prevent flabbiness. Undoubtedly on the cutting edge of Tejo winemaking is Casca Wines, an operation with no vineyards and no winery. As a virtual winery they custom crush whatever they fancy. Their Monte Cascas Fernão Pires is made in a hugely oxidative style not unlike a dry furmint. The minuscule output (116 cases) guarantees a sellout, but this is the kind of avant garde wine that will make sommeliers salivate. If you are inspired to visit, touring Tejo is best done using the gothic Gothic city of Santarem as a base. As Lisbon is only about forty miles away day trips are also an easy haul. Despite its proximity to the capital, the area is defiantly rural and dotted with villages serving the traditional food of the region. The wines of Tejo referred to above are all imported into the London and New York markets. Availability elsewhere in the U.S. is more of a work in progress, but the trend is clear: discovery of the wines of Tejo has begun and they will become more prevalent in international markets in the future.